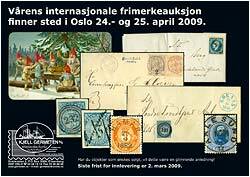 International Stamp auctions. The auction catalogues. Our upcoming auction is due on December 6-7.2013. You are welcome to download the auction catalogue! We are printing a hard copy of the auction catalogue prior to every auction. It is printed in full colour and includes approx. 150 to 180 pages. Vendors and regular buyers receive them free of charge. As a service to inactive customers - and collectors who just want to be kept updated, we have a subscription system. This is a quite typical front page of an auction catalogue from us. A nature photo combined with a motive from philately, most often one of the items in the auction. The reason for this is to combine our interest in nature photographing with philately in order to freshen up the layout a bit. Over the years we have received many positive responses from catalogue receivers all over the world. We are very pleased to learn that our catalogues are considered collectors items as well as the items they present. Elements from our catalogues are also easily recognizable in catalogues from other companies. Auksjonskatalog 68, 29.- og 30. april 2005. The subscription fee is USD 50 or Euro 40, valid for the 3 next catalogues and the correspondent lists of prices realised. We are subsidizing this as printing and postage cost us a lot more. Please visit our page subscription, dealing with relevant details. Occasionally we issue pamphlets, brochures and other printed information. These are normally distributed in larger numbers than the catalogues, which means you are not guaranteed the catalogue for the upcoming auction if you just have received a pamphlet. Catalogue # 71, November 24. and 25. 2006. If you think you deserve a free tryout copy of our next catalogue, please send us an email telling the reason for you demand, including you complete name and address, collecting preferences etc. Due to our paying subscribers, we must limit the free catalogue to just one. Having said this, we emphasize that regular customers will receive catalogues on regular basis, free of charge. Catalogue # 72, April 20. and 21. 2007. We are calculating the number of catalogues issued very carefully in order to limit this important cost. 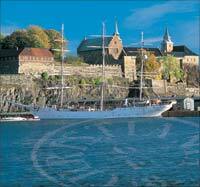 The catalogues are sent out from Oslo in one batch. After this day it may be too late to order the catalogue as we must reserve the remaining stock for customers attending to the auction. The Internet version of the catalogue is pretty much the same as the printed one. The illustrations are smaller in order to make downloads smooth and easy. The Internet version of the auction catalogue is available for download about the same time as the hardcopy version is posted. Many of our customers are fine with the pdf-version and are in no need for the hardcopy. We are, however, happy to learn that there still is a great demand for receiving the original catalogue by post. 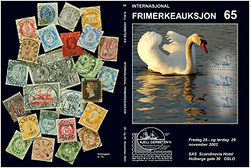 It has its own place in the bookshelf in philately rooms "all over the world". If you would like to be given a message when the next Internet catalogue is ready for downloading, you should be sure we have your last updated mail address. You may fix this right now! A great deal of the lots in an auction are presented to the market for the first time, some of them are very rare and important. The front page of the catalogue 69. The picture is from Prinds Olavs Harbour on South Georgia, taken in 2005. Catalogue # 69, December 2. and 3. 2005. We are producing the auction catalogues ourselves in our office, and we deliver everything ready for printing to a ftp-server for further processing. Erik Olafsen is bringing scans and text together in an optimal layout with good assistance by Maria Grønvold and Harald Svendsen. Kjell Germeten has taken the pictures and is responsible for the systems. Catalogue # 67, December 3. and 4. 2004. Catalogue # 74, April 18. and 19. 2008. Catalogue # 75, November 28. and 29. 2008.
catalogue # 63, November 2001. 7 catalogues from previous auctions.